Behind the digital alchemy he wields for clients, he remains focused on the real people at the centre of these expanding platforms. He identifies with the complex and sometimes contradictory relationships that consumers often initiate, and uses this tension to develop richer and more personal ways to engage audiences. This approach seamlessly integrates the digital platforms our consumers use with the real, storytelling content that helps organisations establish a clear point of difference. 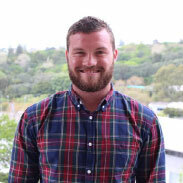 Prior to Brandfibre, Taylor worked in software development and interactive design on projects for AUT, Alarm NZ, and Only The Best, plus a broad portfolio of clients in the healthcare, educational, and nonprofit sectors. His work has been awarded, applauded, and handsomely rewarded with a string of satisfied, successful clients in his wake. Graduating from AUT with a Bachelor of Creative Technologies in 2011, and specializing in mobile iOS development, Taylor thrives on the expanding opportunities and challenges that the digital arena presents. Together with the rest of our digitally-astute team, he helps promote the adoption of cloud-based, mobile, and social technologies for Brandfibre and our client’s.